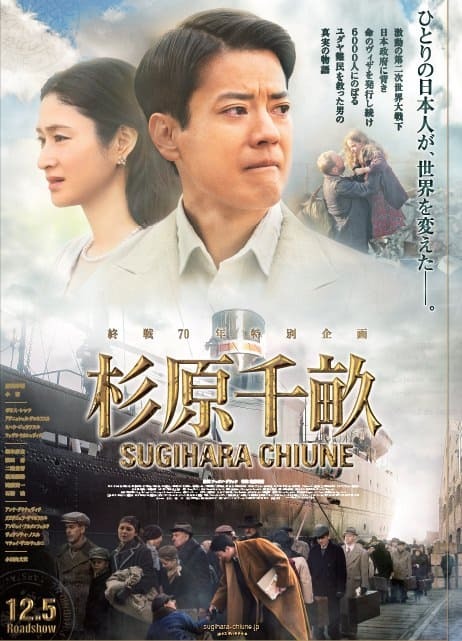 In 2015, a film about the Japanese diplomat Chiune Sugihara and his actions in the midst of WWII was made by Director Cellin Gluck. The film was shot in Poland where most of the Jewish refugees whose lives he saved had escaped from to Lithuania. The movie’s name is “PERSONA NON GRATA” (Japanese movie title: Chiune Sugihara). Chiune Sugihara was a diplomat who issued visas for Jewish refugees, saving 6000 lives in the early years of World War II. He has been known as the “Japanese Schindler” all over the world. The FCCJ (The Foreign Correspondents’ Club of Japan) published a Q&A with Gluck. You can read the full article here. The film’s release has been timed to coincide with the 70th anniversary of the end of WWII in 2015. Coincidentally, now more than two million Syrians have fled their war-ravaged country. We should watch the film and rethink our history, and then we will never make the same mistakes again. 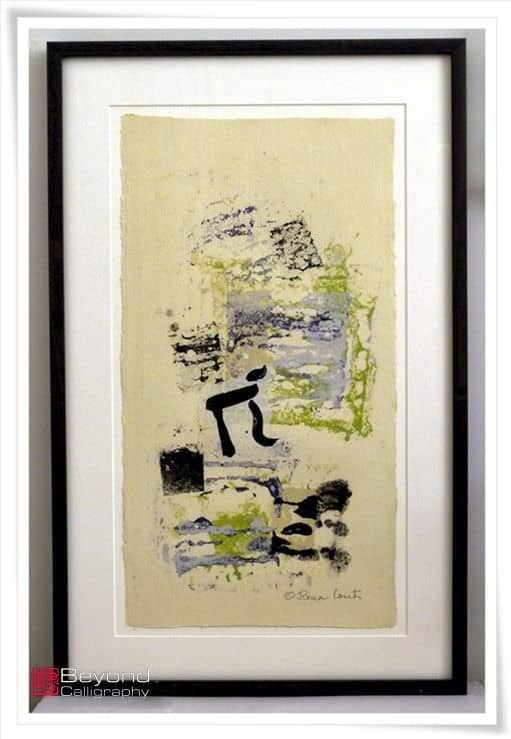 My Calligraphy sister Rona Conti was commissioned to create artwork dedicated to Sugihara Senpo and presented to the Sugihara Museum and Foundation in Vilnius in 2013. 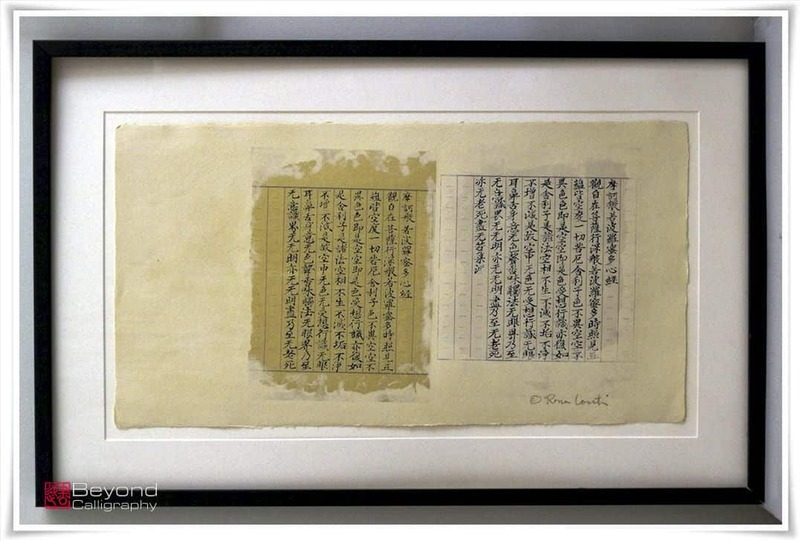 The artwork titled “Fragments of the Heart Sutra” consists of two sections of the beginning of the Heart Sutra, both unfinished, and arranged with a larger empty space as the third component of the whole. I feel deep silence from the empty space next the Heart Sutra, also feel her deep love for many lives and her great respect for Chiune Sugihara. This art by Rona inspires me and touches my heart. We artists can express many sentiments and opinions in our arts. Making art or a movie or something about someone who helped the lives of many people like Chiune Sugihara is an admirable attitude. Therefore I am sharing this information about Cellin Gluck’s movie and Rona’s art. SAKIKO YANAGISAWA san, I have heard about Chiune Sugihara a couple years ago on an NHK documentary, a Japanese diplomat who was instrumental in saving several thousands Jewish people trying to escape Nazi Germany, and subsequently about this film last year. I am glad that you discussed the film for not so many people in the world knew of Chiune Sugihara and his ways of trying to save those desperate Jewish people by ignoring at some point orders from the foreign ministry in Tokyo. Thank you for your comment. In spite of Chiune Sugihara being a great person to be proud of, not many people know about him. Japanese also do not know about him. I will translate this article into Japanese and have it published on Beyond Calligraphy. I hope a lot of people will know better about Chiune Sugihara and think about the misery of war.